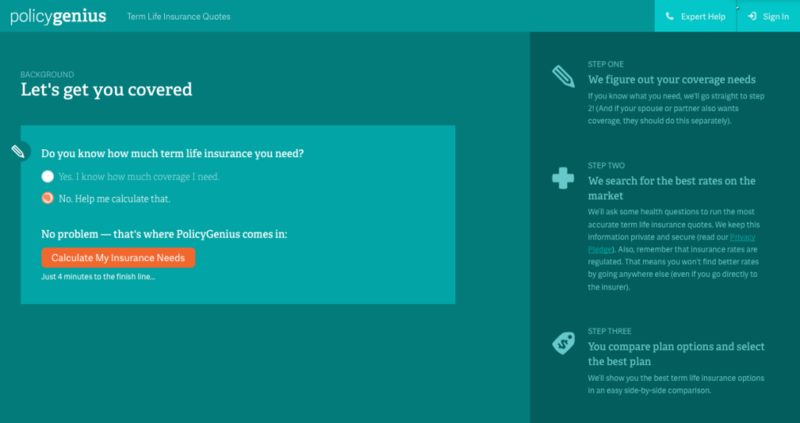 The goal of this article is to personally introduce you to PolicyGenius and help you see just how simple buying term life insurance can be. Why don’t you walk through this process with me step-by-step? 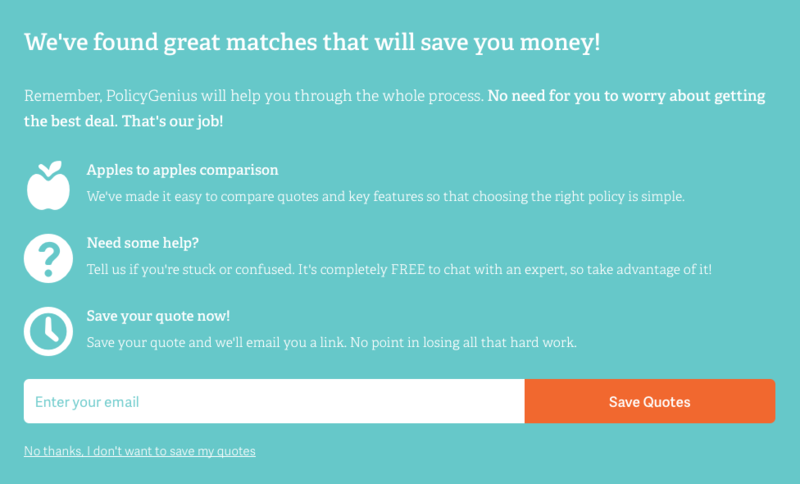 Go ahead and click the get your quote button and we’ll get started. 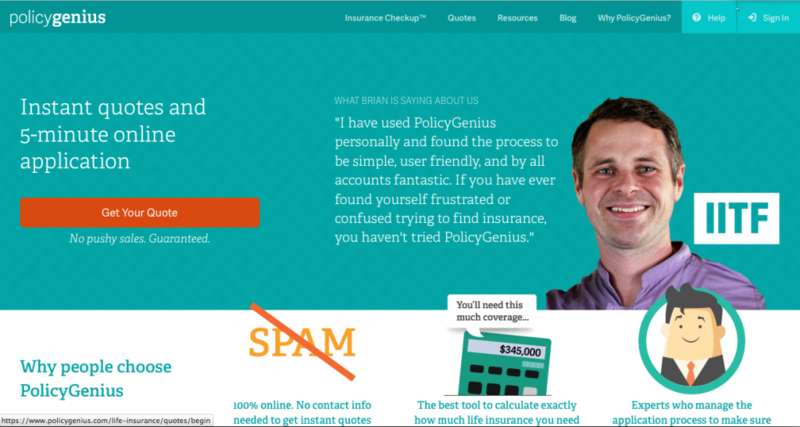 From this very first screen you can already get a glimpse of the greatness of PolicyGenius. 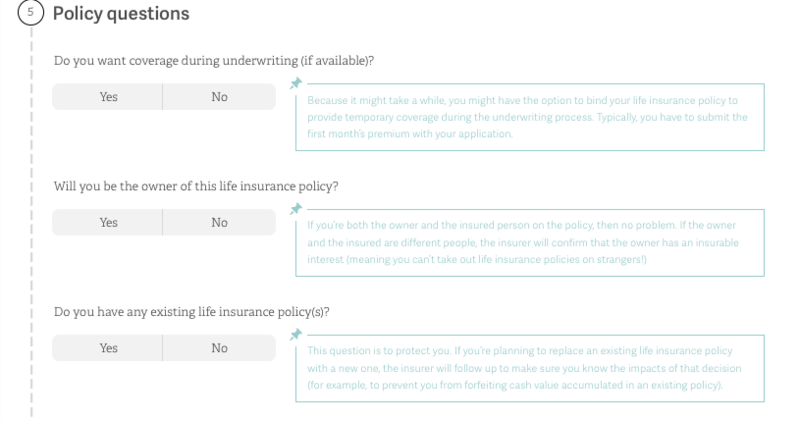 If you are like me, you probably have no idea where to get started when it comes to buying term life insurance. 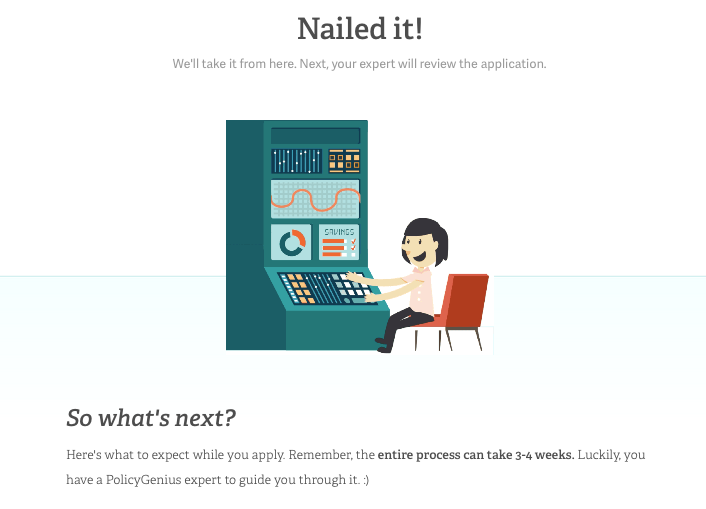 No worries, PolicyGenius is way ahead of the game. 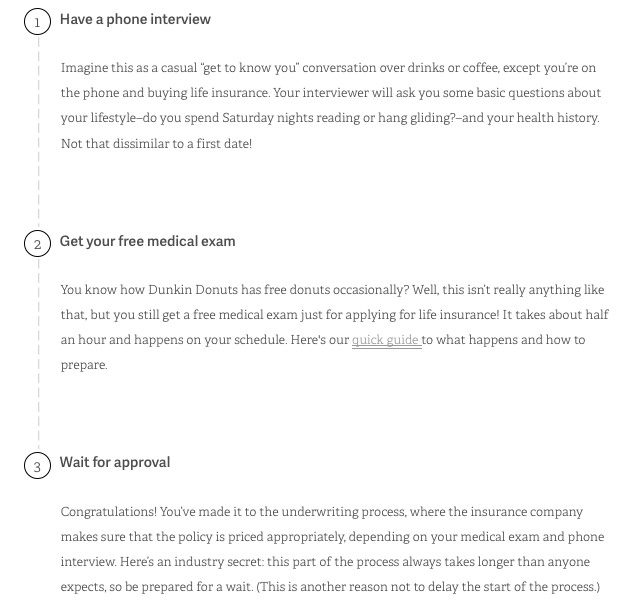 As you can see, if you know how much term life insurance you need, they have a fast track process to get you moving. 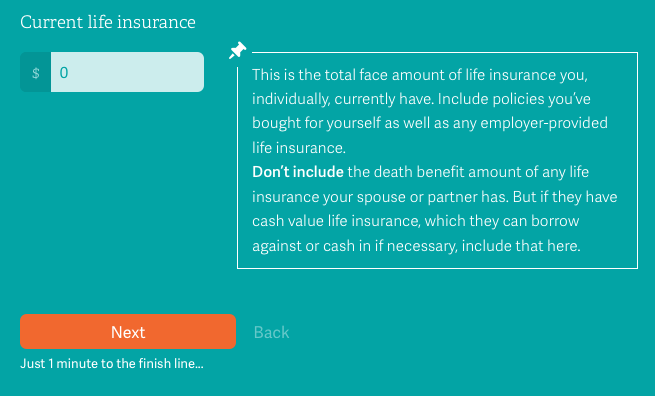 If you do not know how much term life insurance you need, they have a quick and easy tool to help you figure it out. As you see above, I selected the “No. Help me calculate that” option. That selection led me to the screen above. As you can see, the information you need is a very simple and basic. This is all stuff that you can quickly rifle through and move on. Things like first name, gender, date of birth, etc. If you want to see all the info they need on the screen, check out the image below. Another thing I want to point out right now, is this cool little feature at the very bottom of the screen. It’s so small that it doesn’t show up very well on my screenshots. I love that. I like knowing where I am in the process and how close I am to being done. When it comes to buying term life insurance, your family status is a big deal. After all, you purchasing term life insurance is not about you at all, it’s about your family. 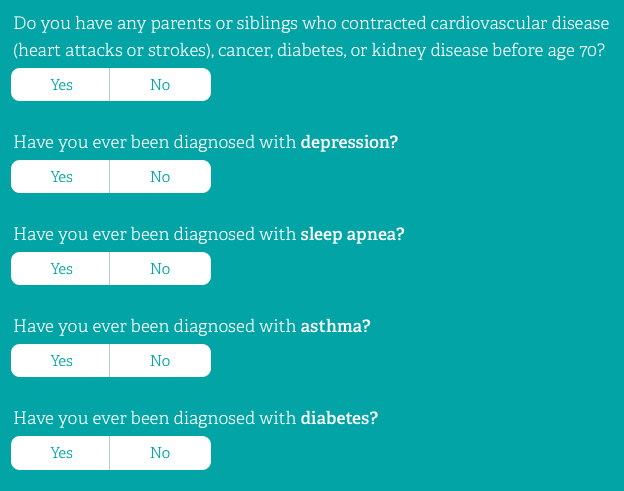 So, PolicyGenius is going to ask you some very simple questions about your family. 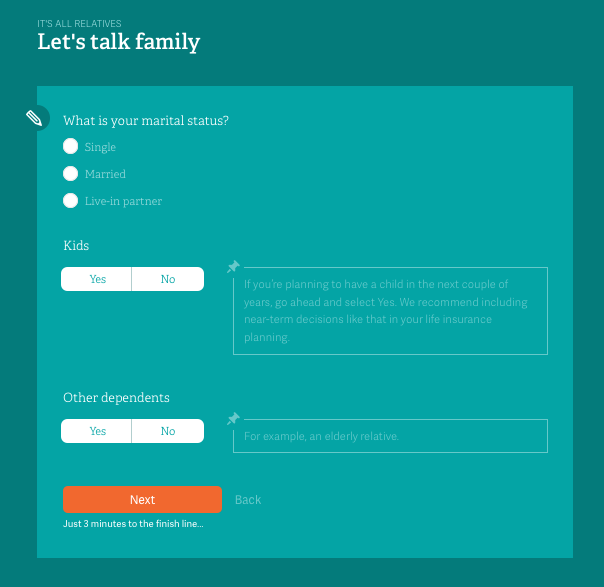 Things like marital status and whether you have kids or other dependents. This is another place for want to pause and point out another policy genius feature that I think is fantastic. You see that very lightly shaded box to the right of the yes no question about kids? 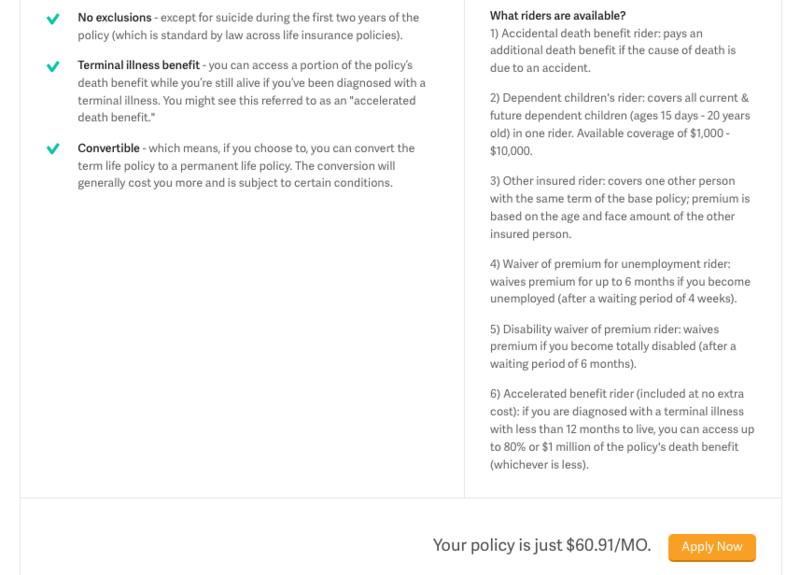 I know you can’t really read it on the screen, but this is one of many extra helps the policy genius ads along the way. For any question that is not super obvious, PolicyGenius goes the extra mile to clearly explain what that question is specifically asking. This means you don’t have to waste any time racking your brain attempting to decipher complicated insurance terminology. There are no mind games here. 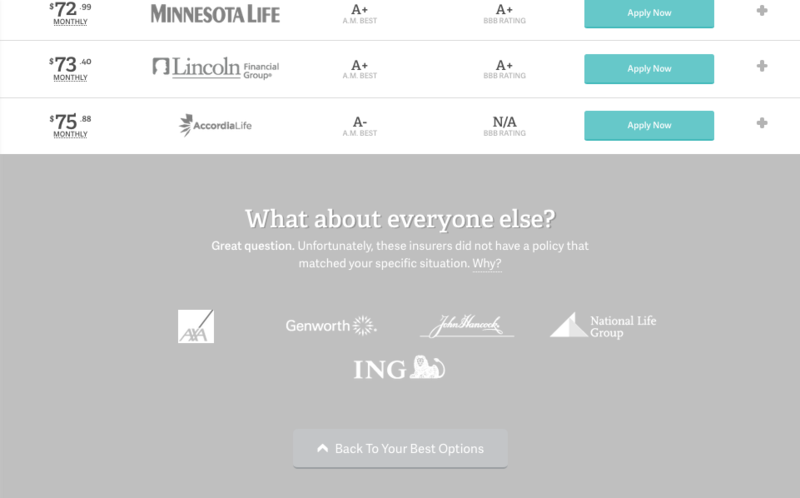 Just some really helpful people who want to make buying term life insurance a positive experience and dare I say enjoyable. Now, once you click the “Next” button and move on to the next screen, PolicyGenius is going to ask you about your desires for your child’s care and education. At this point, let’s take a moment and acknowledge why term life insurance exists. 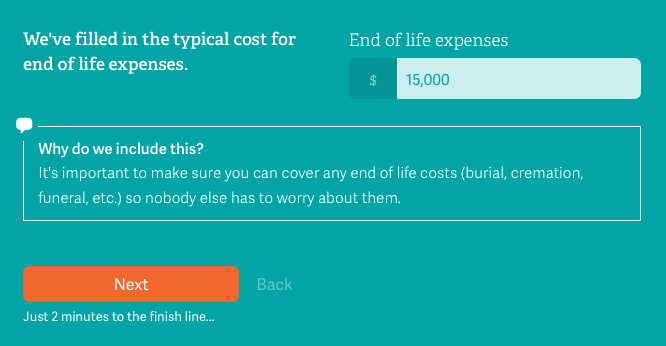 The reason you are considering the purchase of term life insurance is because in the terrible circumstance that you die, you want to do what you can to ensure that your family’s cared for financially. With that in mind, what kind of care and education do you hope to give your child the future? 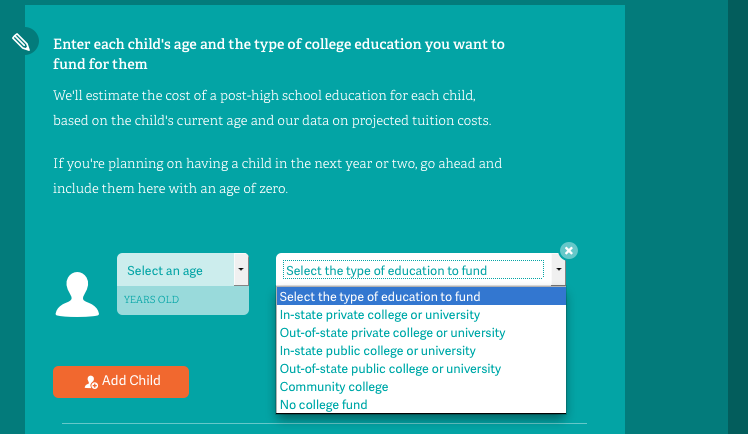 PolicyGenius wants to know if you have any children and if so how old are your and what type of education you want them to build a have. 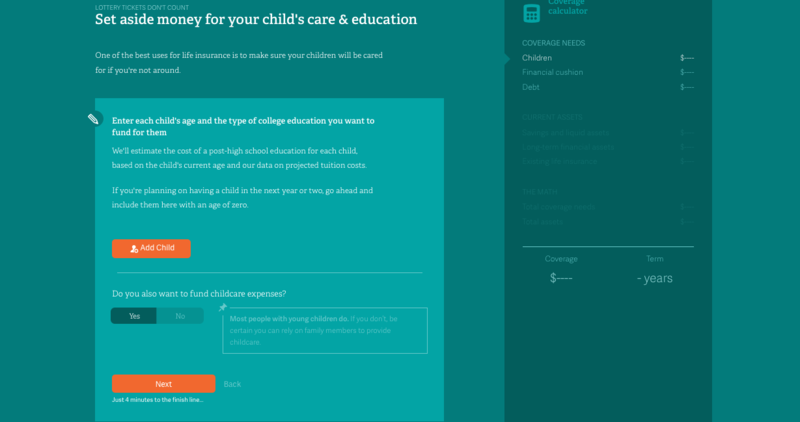 The next thing that you need to answer is whether you will want to find childcare expenses. This is a simple yes or no question. Once again, PolicyGenius offers a helpful explanation box just in case the question is not clear enough. The next screen addresses the issue of how much financial support you want your family to have in the event this and happens to you. You can see the screenshots below which provide a nice visual. Off to the right of the page PolicyGenius is showing you how your inputs are being used to calculate the amount of coverage you need. Pretty cool stuff. In this sample, I have entered in some generic numbers for illustration purposes. Once again, PolicyGenius steps in to give very clear and helpful explanations for each question. In this example, I would’ve had no idea what to enter for my yearly amount. 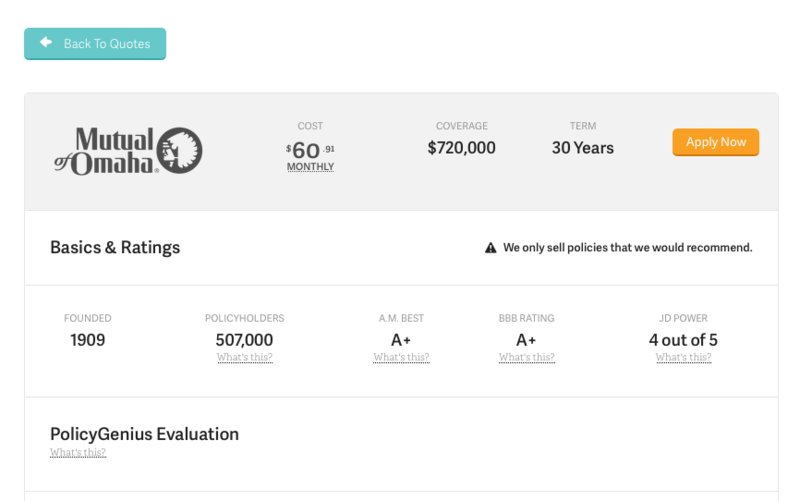 Not only did PolicyGenius auto populate this field based upon previous information, but through this little help box they help you understand where that number came from and give reasons for why you might want to change it. On top of that, they give advice on what you should change it to. 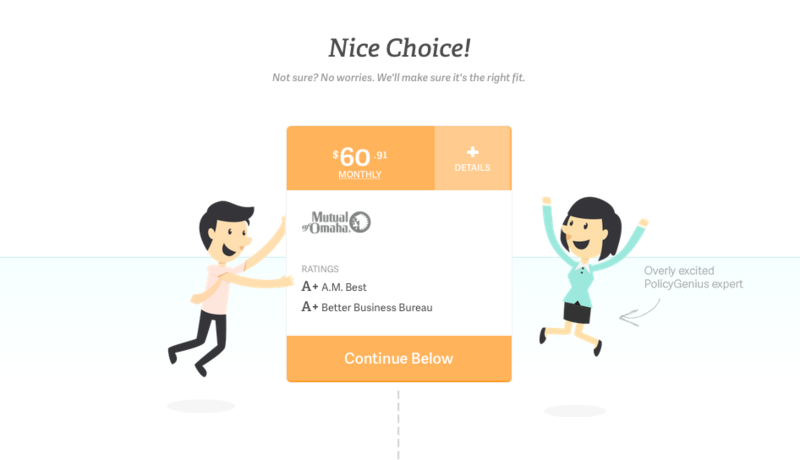 Seriously, buying life insurance was never meant to be this cool. Once this page is complete, you click the ” next” button and you are on your way. As you do so, take note that we are now three minutes to the finish line. The next page gets into your current debt situation. 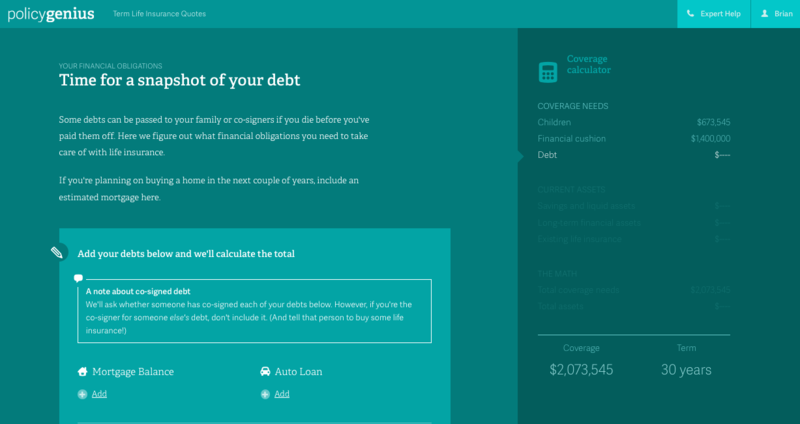 This covers everything from mortgages and student loans to car payments, etc. 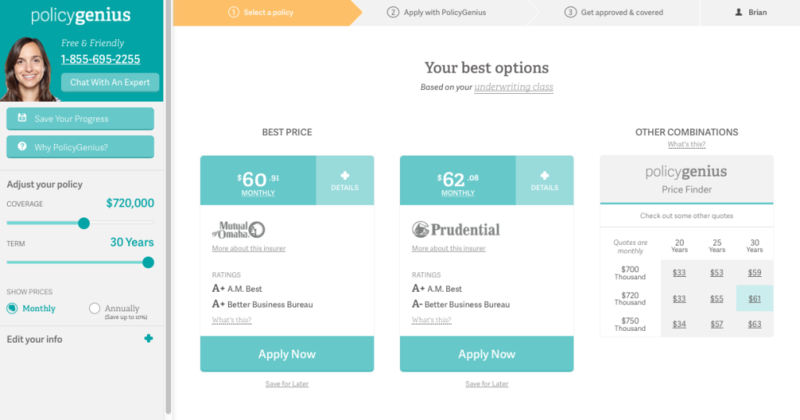 Why does PolicyGenius need my debt information? I know, debt is not something that many people like to talk about. Remember, if something happens to you, then your family will likely inherit these debts. Being careful to provide accurate information here, could make a significant difference for your family down the road. I know it’s small, but the screenshot below shows everything they will be asking for. 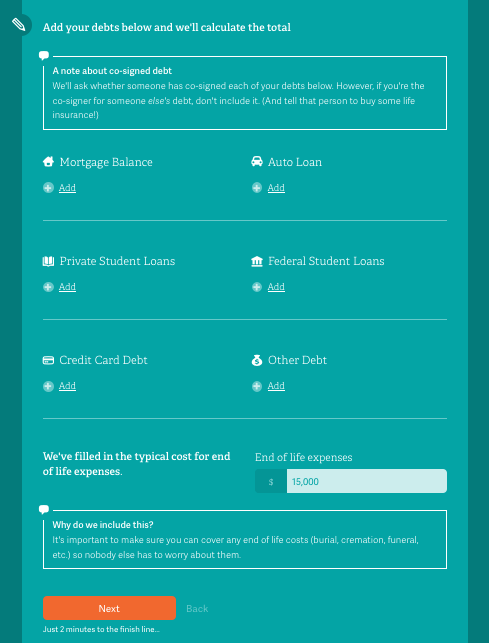 As you can see they ask about mortgage balances, auto loans, private student loans, federal student loans, credit card debt, and any other debt you may have. See that little white box at the bottom right? I’ve zoomed in so you can see it in the image below. 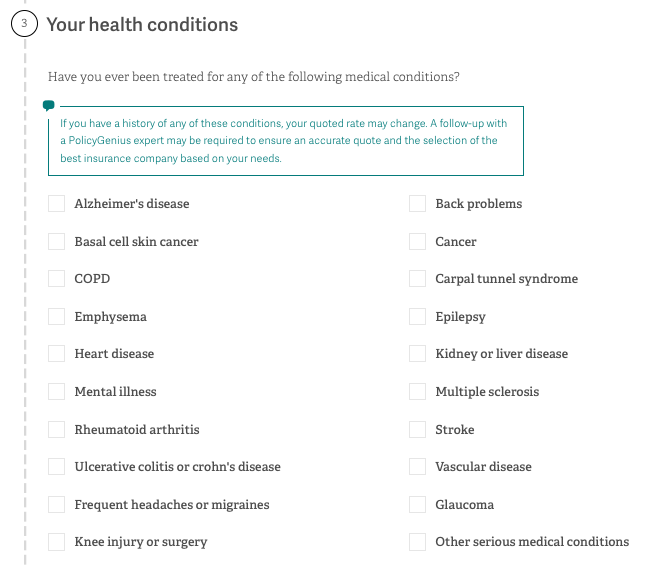 This is an auto-populated field ( that you can change if you want) that shows another way that PolicyGenius goes the extra mile. Have you ever known someone who has lost a friend or family member and talked about how high the end of life costs can be? Thanks to PolicyGenius, your family should not have to concern themselves with this. 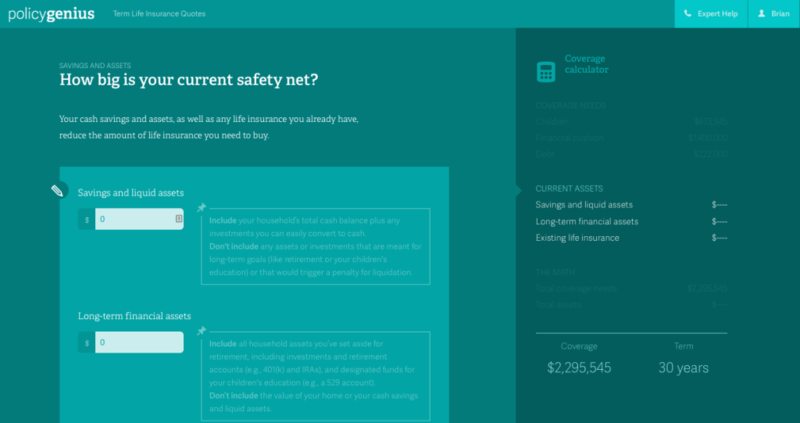 The page shown above shifts gears in order to get an idea of how big your current safety net is. The images below show you exactly what they are asking for. I include them here so that you can be sure and be prepared in advance and have the information ready and available. 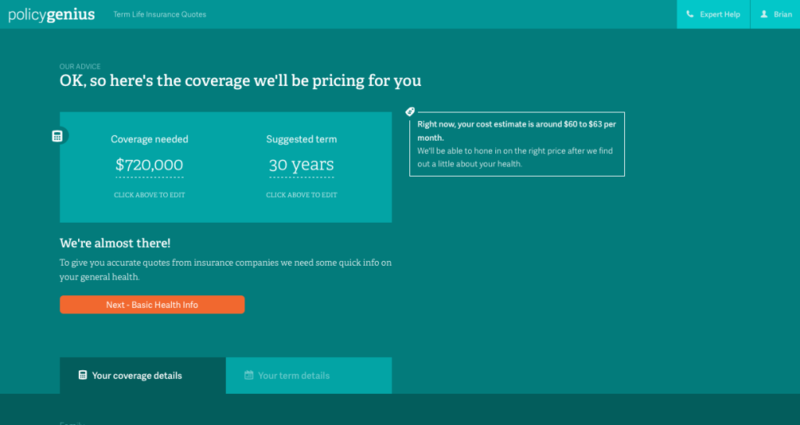 Now, you’ve completed everything needed in order to calculate the amount of coverage you will likely need. This part of the application is finished! 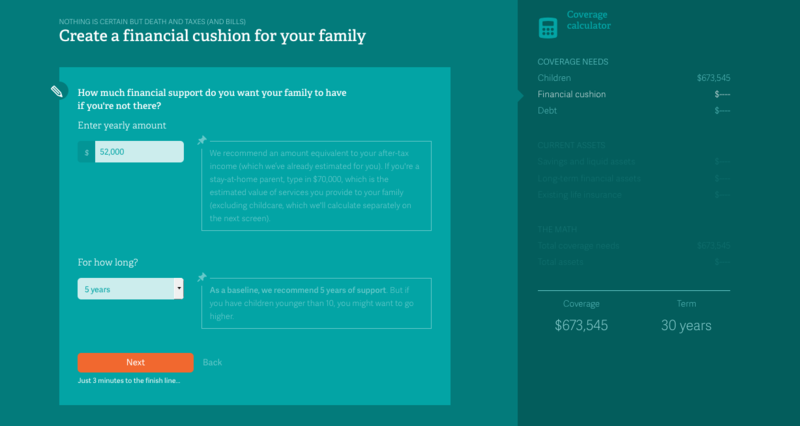 Remember, when we started this process we selected the option for PolicyGenius to help us calculate our coverage needs. 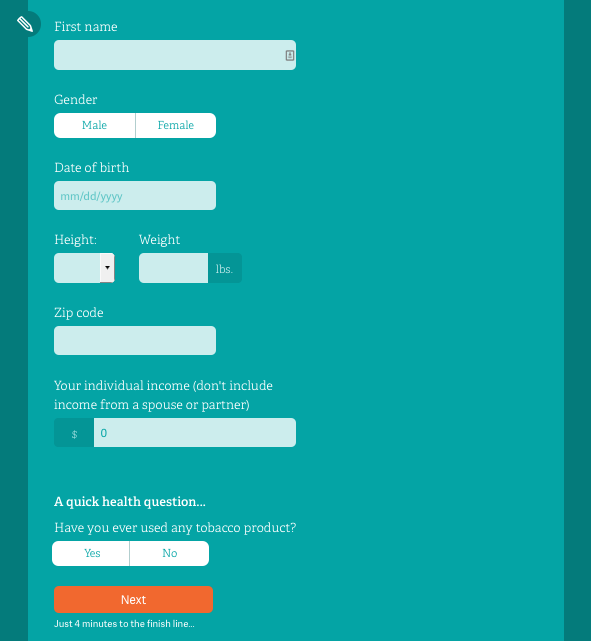 Had we skipped that portion we would’ve jumped ahead to the part of the application dealing with basic health information. You can see the orange button on the screen below, let’s click that and go there now. 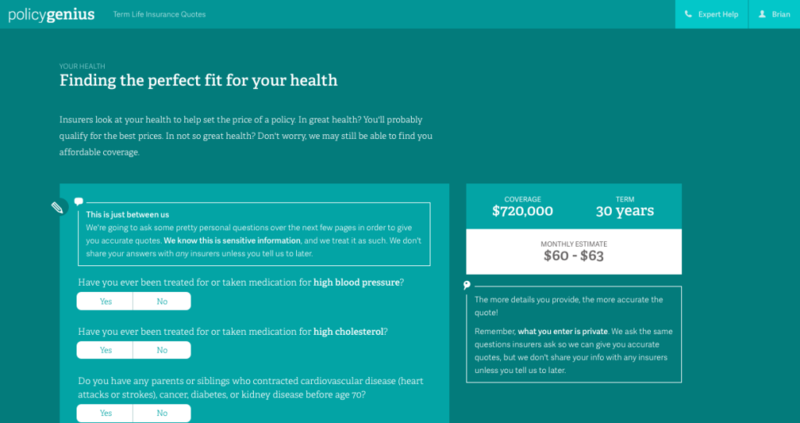 Now, it’s time to find the policy that offers the perfect fit for your health. At this point, you should be looking at a screen similar to what you see below. Let’s zoom in so you can see exactly what they’re asking you for. First, PolicyGenius addresses the concern that is likely on your mind right now. Can I trust you with this information? 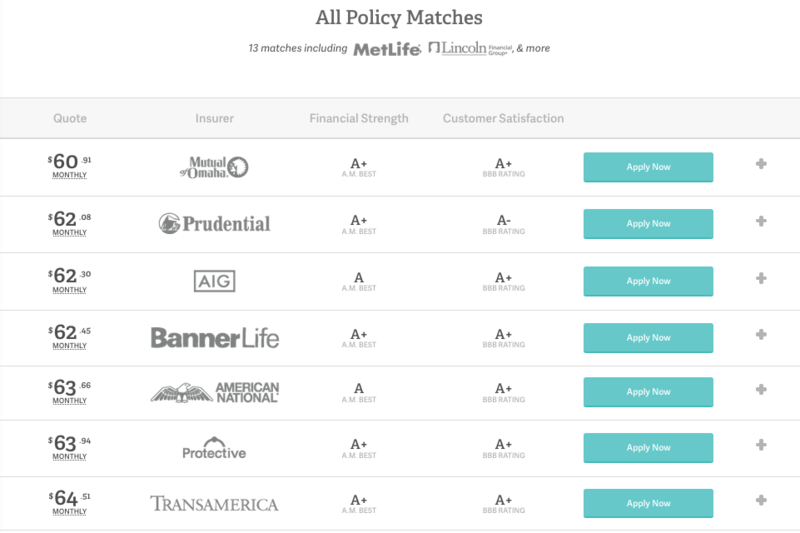 The only reason PolicyGenius asks for any of this information is because providers of term life insurance require this information. 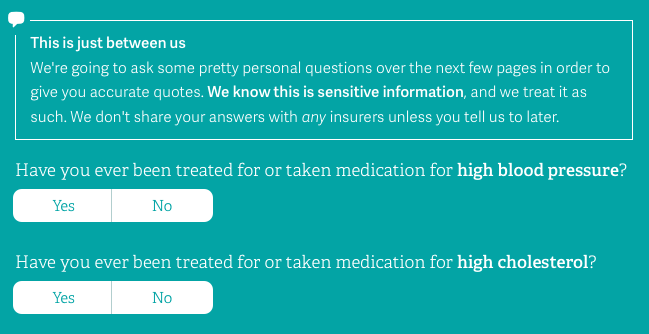 Better yet, PolicyGenius makes the promise to not share this information even with insurance companies until you later give them permission to do so. 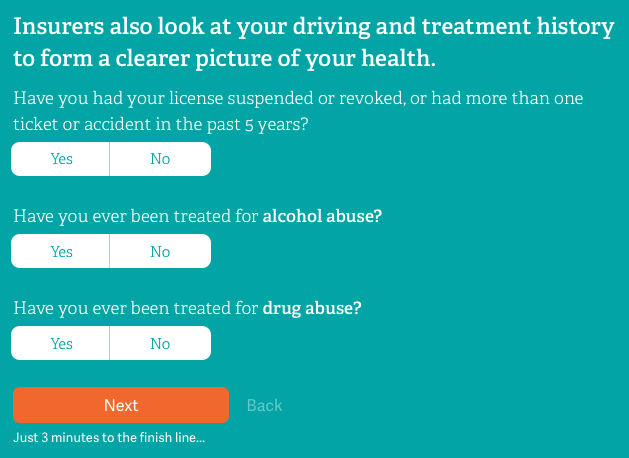 Finally, on this page you will be asked about your driving history and experience with alcohol and drugs. 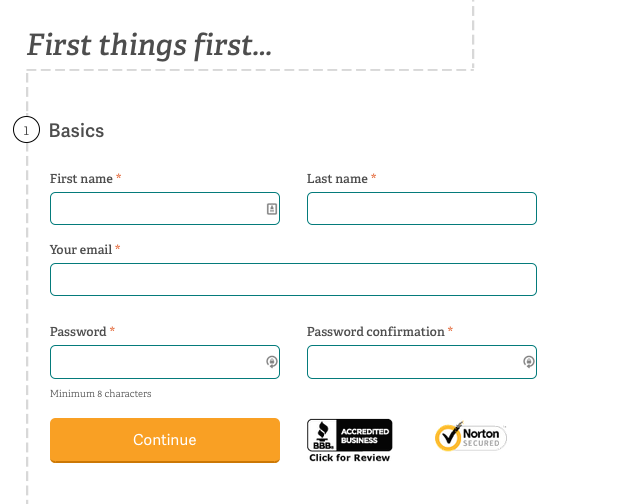 This screen asks for your email, but if you’re really averse, you can skip this step as well. 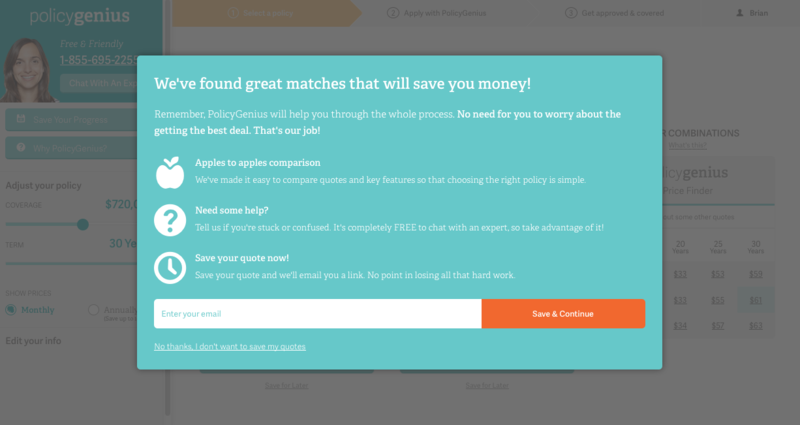 Now, PolicyGenius shows you not only your best options, but all the other options so you can sort through to find the right match. You can see below what this looked like on my test run (sample numbers). 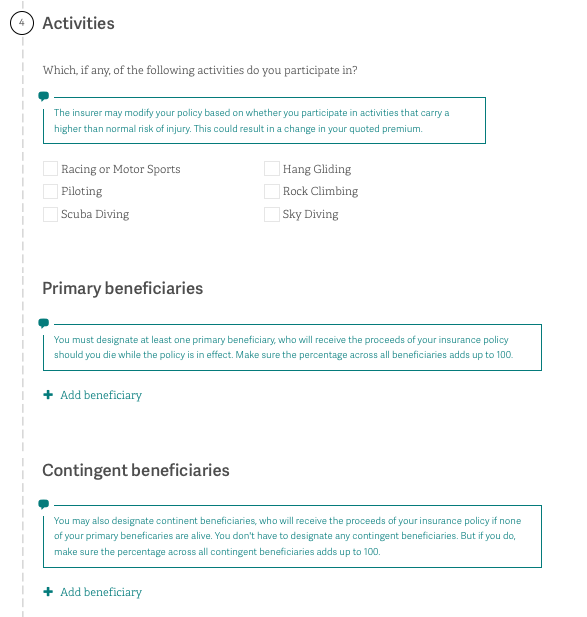 If you’re curious to learn more about a particular policy, you can select the policy and get all kinds of info. All of this with no commitment! 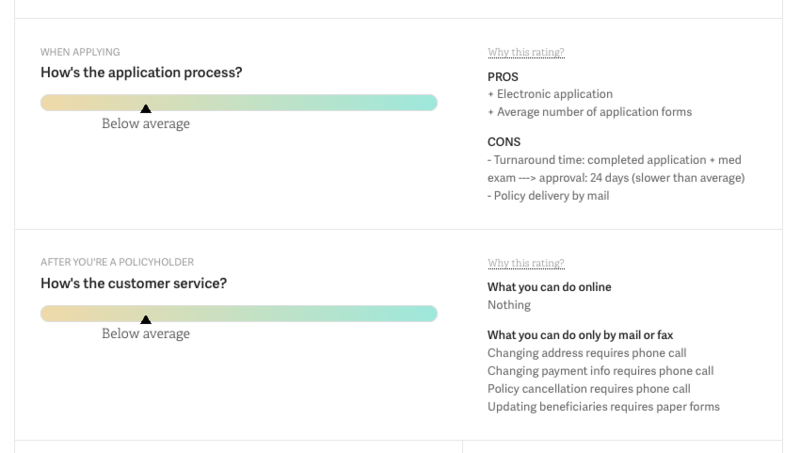 Once you are ready to take the plunge, PolicyGenius walks you through a quick process to help you fill out required information by insurers (no way around this no matter who you use to get your life insurance). As you would expect, there is a chat window waiting for you in the event you have any questions at all. Some quick health info is needed as well. 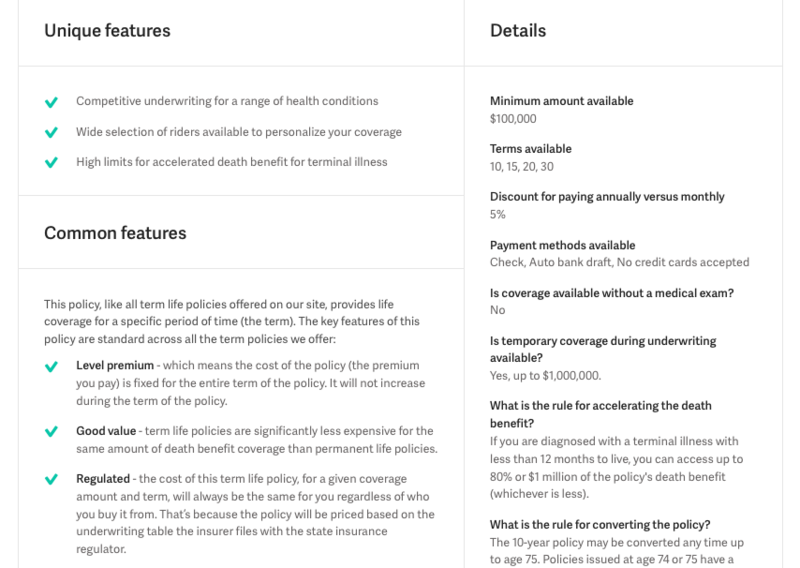 Remember, this is all info specifically required by the life insurance provider, not PolicyGenius. 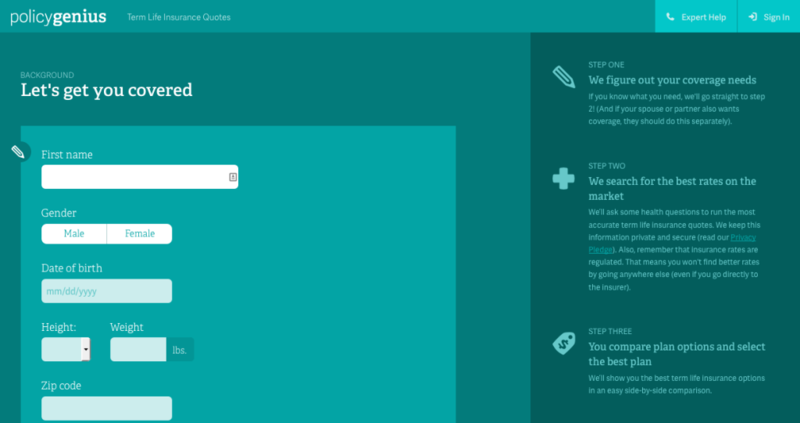 Step 5 below has some more technical questions, but as expected, PolicyGenius has helpful description boxes to help you make a quick decision. Social Security number?! NO!!! I don’t like giving mine out either, great news is you can give that info later over the phone if you prefer. 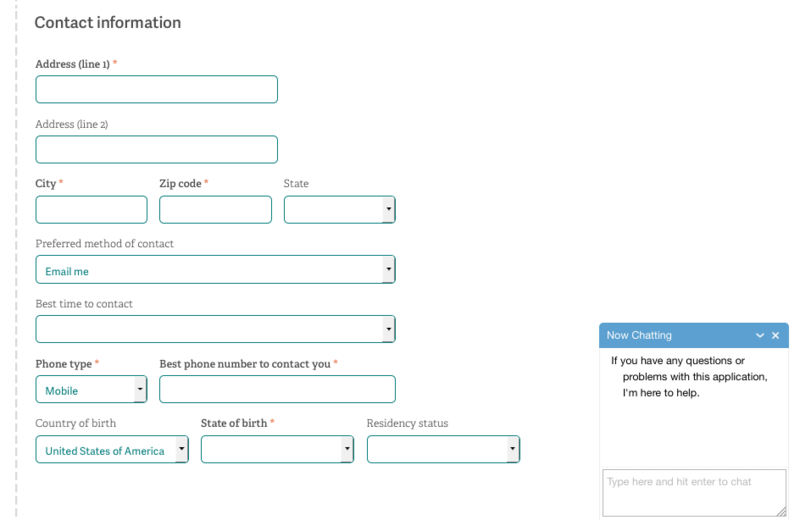 After I filled out all of this info, I quickly received a phone call from a very friendly PolicyGenius representative. He was an experienced life insurance agent who was able to answer all of my questions (no matter how basic) and never once pushed to sell me a policy. It felt like talking to a friend in the industry. 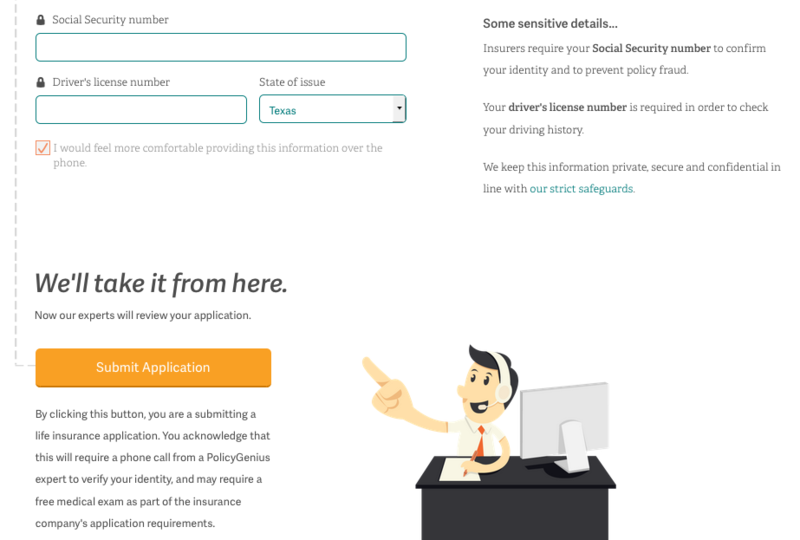 A driver’s license was required to validate identity and eventually you will need to give your social security number if you want a policy. Take note, your social security number is protected health info by federal law and cannot be used or sold outside of your specific application and purpose. In other words, you can know they are on your side. I told you I’d be thorough! 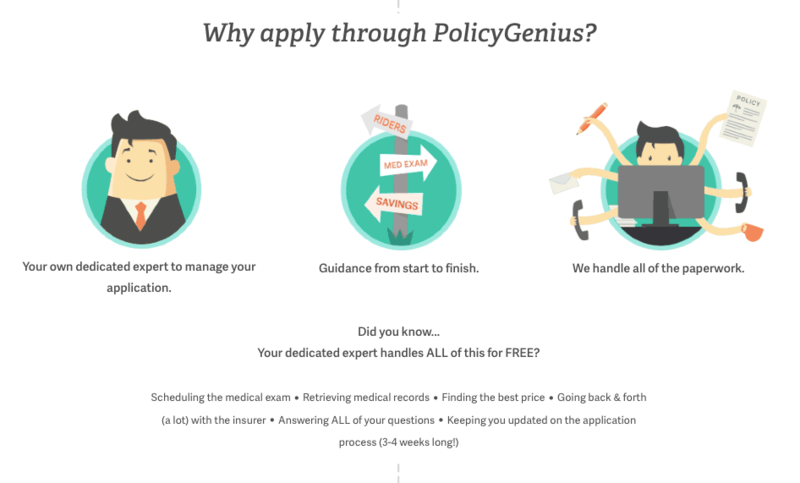 Now it’s up to you, take an important step to protect your family and visit PolicyGenius today. Disclaimer: All contents are for information purposes only. There are risks involved with investing including loss of principal. All readers must be responsible for and make their own investing decisions. Each reader bears the full responsibility for their own investment. Nothing in this article is to be considered investment advice, a formal recommendation, or solicitation to buy or sell any security. Investor in the Family LLC makes no explicit or implicit guarantee with respect to performance or the outcome of any investment or projections made. There is no guarantee that the goals of the strategies discussed by Investor in the Family LLC will be met. Investor in the Family LLC may receive payment for promoting some products found in this article. Even so, Investor in the Family LLC aims to promote products that it has tested and believes will add value to readers. Please see full Disclaimer.